The far reaching repercussions of Ireland’s historic 1916 Easter Rising and specifically its effect on Australia during a time of war will be explored as the State Library and the University of Melbourne partner to commemorate the centenary of this seminal moment in Irish history. 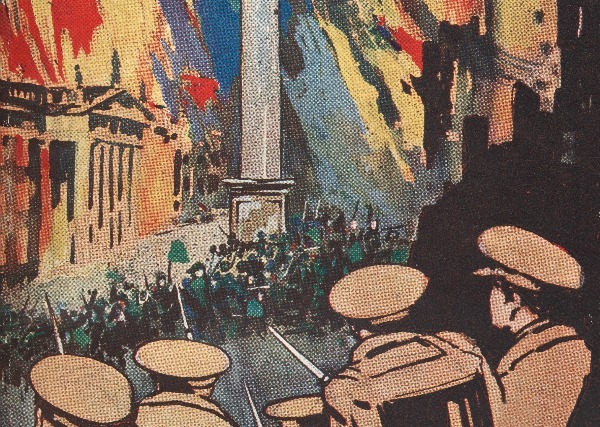 The 1916 Easter Rising was a six-day uprising in Dublin that is now recognised as a most pivotal moment in the Irish struggle for independence from Great Britain. It would be followed by a succession of historic events in Irish history including the War of Independence, the Irish Civil War and the Partition of Ireland. Together the State Library and the University of Melbourne lead Melbourne’s prominent role in the global commemoration of the 1916 Easter Rising with a public exhibition, academic conference, panel discussion and documentary screening all proving fascinating insights into the impact the Rising had in Ireland and on the Irish around the world. “With millions of Australians from Irish heritage our histories are intertwined. 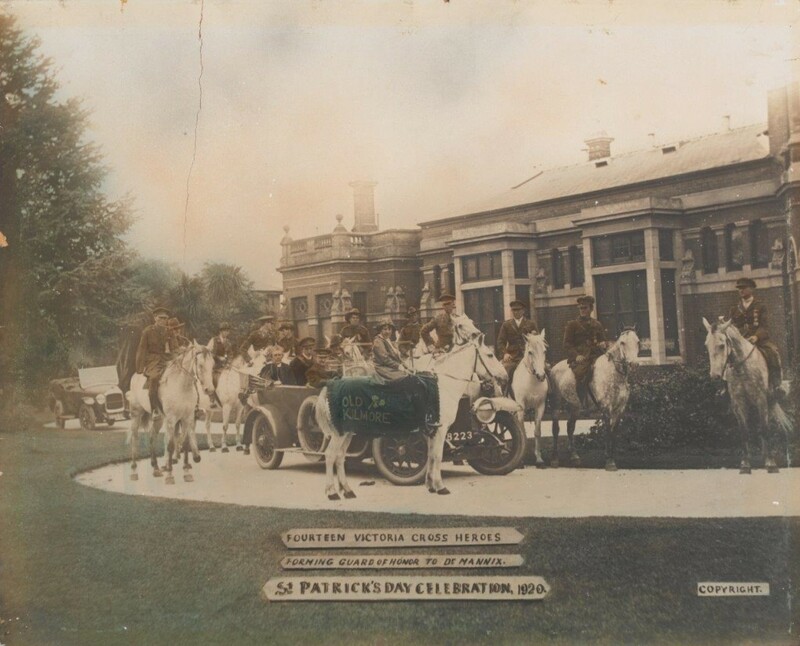 We will exhibit unique collections that reveal how keenly the Irish Easter Rising was felt in Australia and the effect those events abroad had on our own history,” said Kate Torney, CEO State Library Victoria. “We are honoured to partner with the State Library Victoria and to work with the Irish Government to provide both a rich academic and public stream of discussion on a transformative period in Irish history. Ireland and Australia share a deep historical lineage and as Australia’s leading university we are proud to play a role in this remarkable global programme of events” stated Professor Glyn Davis, Vice- Chancellor of the University of Melbourne. The University of Melbourne will host a two-day international academic conference including regarded keynote speakers Dr. Fearghal McGarry, Queens University Belfast, Dr. Roisin Higgins, Teeside University and Dr. Guy Beiner, Ben-Gurion University. The conference will occur on 7 and 8 April at Newman College. “Ireland’s Easter Rising impacted not just in its own country but across the globe and in particular here in Australia. We have convened some of the leading academic minds on this historical period to provide insight into a remarkable period in Irish, world and Australian history.” stated Professor Gillian Russell, the Gerry Higgins Chair in Irish Studies at the University of Melbourne. 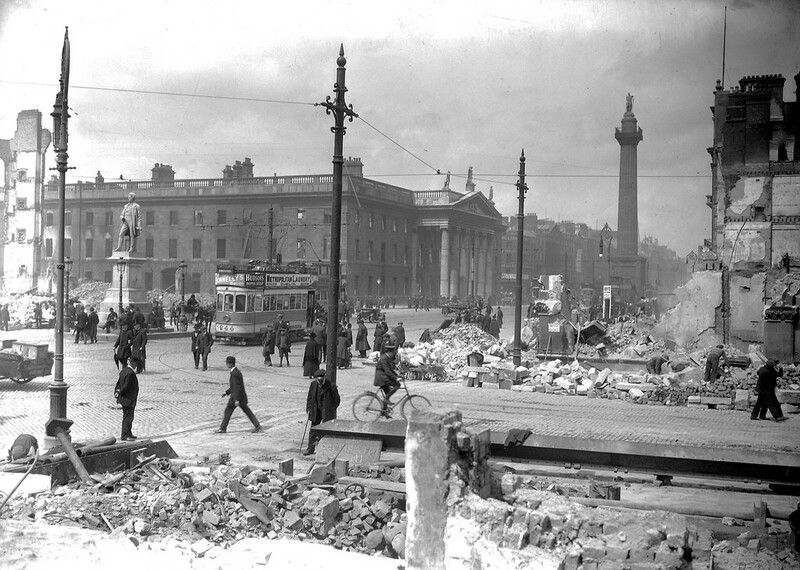 The Irish Rising: a terrible beauty is born opens at the State Library on Thursday 17 March. The free public exhibition will be on display in the Blue Rotunda Gallery daily from 10am. Wonderful news SLV. Your readers might be interested to know that one of our past staff members developed a fantastic set of resources on our staff/public wiki re the history of Irish Famine Orphans immigration to Victoria. Resources are here http://wiki.prov.vic.gov.au/index.php/Irish_Famine_Orphan_Immigration While this obviously predates the 1916 events the history is fascinating. I note that they omit to mention that there is a Monument in Melbourne to the Irish Famine Orphans. It was unveiled in Williamstown (on Hobson’s Bay) on 6 Dec 1998, on the 150th anniversary, to the day, of the arrival in Hobson’s Bay of the first boatload of Irish Famine Orphans on the Lady Kennaway. Thanks so much Asa – I’m the curator of this exhibition and I’m also working on a research guide about the Rising, in which I will include a link to the excellent resource your colleague developed. Thanks again! 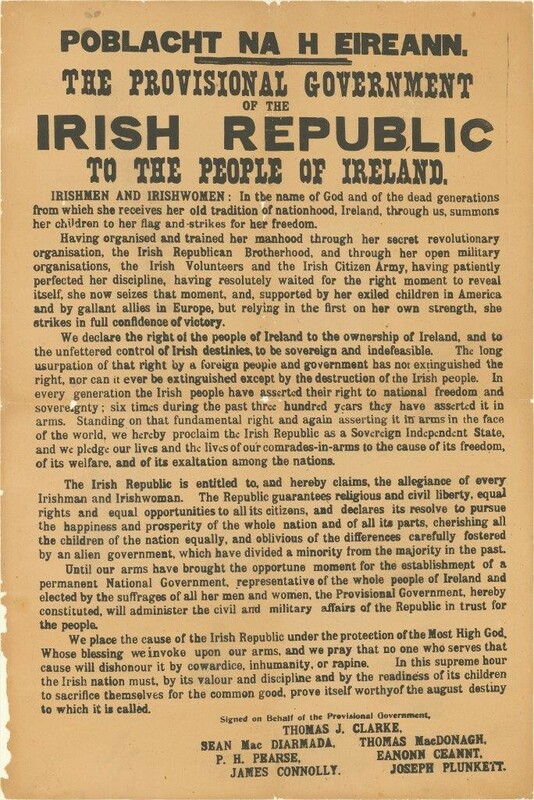 The 1917 reproduction of the proclamation is actually rarer than the original as the british seized the print so not many are none to survive. As for the only one in Australia – make that probably two as we have one here in Sydney. Thanks James, it would be great to find out more about your copy. Great to see such interesting work being done on 1916 in Melbourne. This week we started our Centenary work with a slide show and talk for our senior students on the roles people from Fairview and Ballybough played in the Rising. The girls from 5th and 6th class will be fascinated to learn that there is such interest in our small Irish Rising on the other side of the world!! Congratulations to all at State Library Victoria and University of Melbourne. Thanks Liz – that’s great! relative of the Irish Seven rebels who were interned in Darlinghurst gaol in Sydney in 1917. This was a direct result of the Easter uprising and anti Irish sentinent in Australia. stumbled across this and found it interesting. Great job on this one and thanks for sharing. Looking forward to such events in Melbourne..